ATP1A3 mutations in AHC. Heinzen and colleagues applied exome sequencing to seven patients with AHC and compared this data with the parental exomes (trio exome sequencing). In each of the seven patients, they managed to identify de novo mutations in ATP1A3, the gene coding for a brain-expressed sodium-potassium ATPase. Mutations in the same gene were also identified in ~75% of a large follow-up cohort of AHC patients. This finding establishes mutations in ATP1A3 as the major cause for AHC. ATP1A3 is no stranger to the field of neurogenetics, as mutations in this gene are known to cause rapid-onset dystonia-parkinsonism (DYT12). DYT12 is a genetic disorder with sudden onset of involuntary movements and parkinsonism starting in childhood or adulthood. However, in contrast to the ATP1A3 mutations found in DYT12, AHC-related mutations do not affect protein expression, but only the activity of the enzyme. The role of ATP1A3 in AHC. Sodium-potassium ATPases are crucial for maintaining the membrane potential as they maintain the gradient of sodium and potassium across the plasma membrane. In neurons, the maintenance and regulation of this gradient is important for their excitability. If this function is impaired, excitability may get dysregulated, which then results in the symptoms of AHC and other associated symptoms including movement disorders and epilepsy. 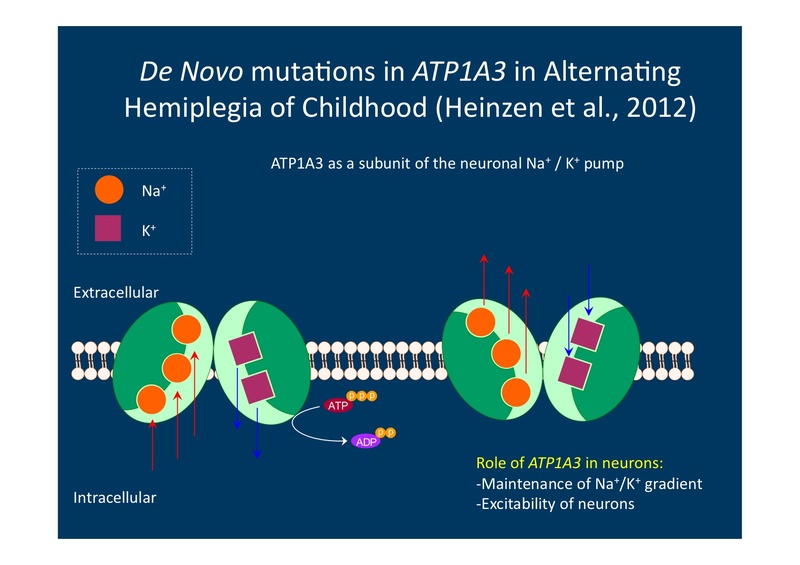 Function of ATP1A3 in neurons. This ATPase subunit is important for maintaining the electrochemical gradient across the plasma membranes. Temporary breakdown of this gradient causes the symptoms of AHC and DYT12. Implication for EuroEPINOMICS. This study highlights the power of trio exome sequencing in rare genetic disorders, which is also applied in EuroEPINOMIC-RES. This method is important not only for identifying entirely novel causative genes, but also unlikely or second-tier candidate genes that have not been tested yet. In fact, researchers have looked for the genetic cause for AHC in the past, but have missed ATP1A3 as a candidate gene. Identifying 7/7 patients with mutations in the same gene is a lucky, but extreme finding, suggesting that the phenotype was well chosen. This suggests that other well-defined phenotypes such as specific epilepsy syndromes might also provide the chance for gene identification through this methodology. This entry was posted in 2012, Epileptic encephalopathy, EuroEPINOMICS, Papers and tagged alternating hemiplegia of childhood, APT1A3, dystonia, epilepsy genetics, exome sequencing, parkinsonism. Bookmark the permalink.